Dhanvantari is depicted as Vishnu with four hands, holding medical herbs in one hand and a pot containing rejuvenating nectar called amrita in another. A shankh and Jaluka in oher hands.The Puranas state that Dhanavantari emerged from the 'Ocean of Milk' and appeared with the pot of nectar. 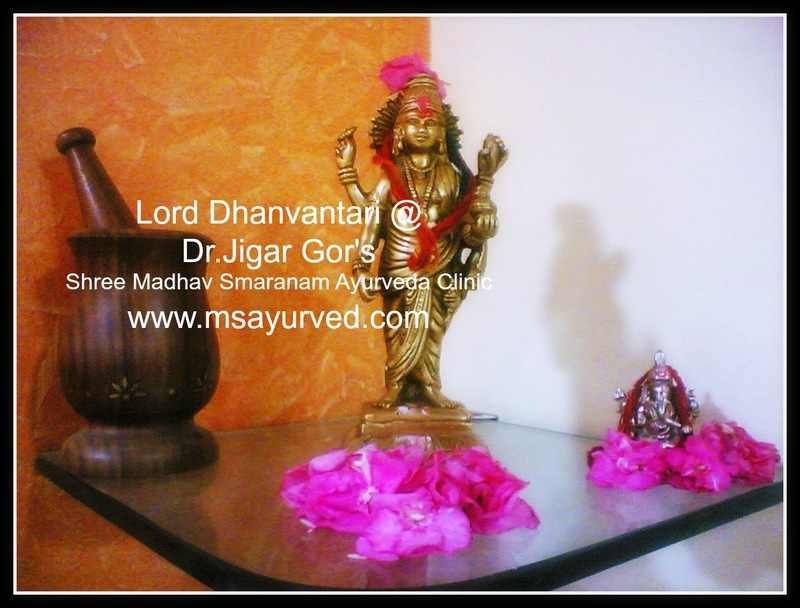 Birth day celebration of Lord Dhanvantari ( the God of health, healing and cure ) is celebrated with great enthusiasm and happy environment, by Dr.Jigar Gor every year at his Treatment center on Dhan Teras, two days before Deepwali, the Hindu festival of Lights. The origins of the ancient healing science known as Ayurveda are lost in cosmic antiquity. According to the ancient text Caraka-samhita, this "Science of Life and Longevity" is eternal and is revealed in each universe in each of its infinite cycles of creation and destruction. This healing science is generally revealed by great sages or demigods. 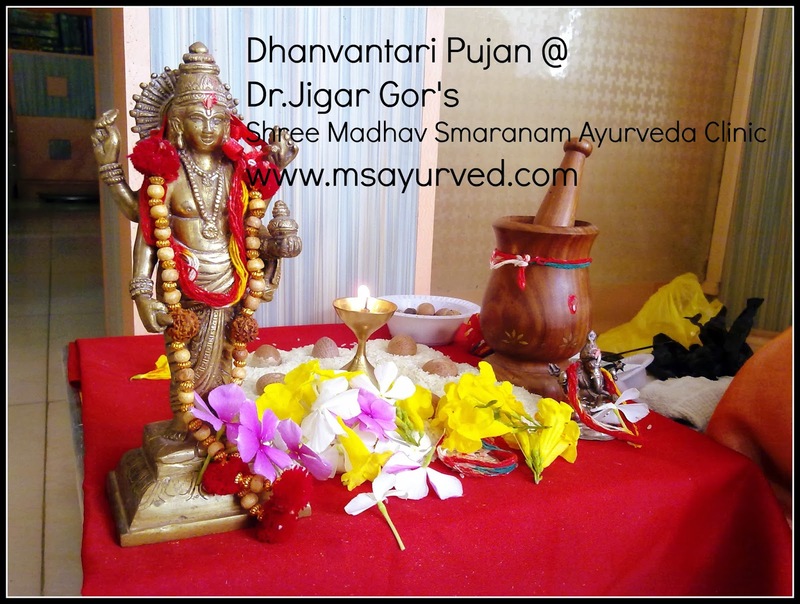 Occasionally, the Supreme Lord Himself descends as the avatara (incarnation) Dhanvantari and re-inaugurates the tradition of Ayurveda. This extremely rare appearance of God is recorded in the Vedic literature of ancient India. He first appeared during the great churning of the cosmic milk ocean to deliver amrta (nectar) for the nourishment of the demigods. The churning of the milk ocean is one of the most famous episodes in Puranic history. The second appearance occurred at the beginning of the reign of the current Manu in the second Dvapara-yuga, two billion years ago. Lord Vishnu foretold at the time of the churning that Dhanvantari would appear again in the human society and be offered sacrifices and worshipped by human beings. He would also teach them the science of Ayurveda. Dhanvantari at that time was residing in the heavens and Lord Indra seeing the misery of human beings afflicted by disease on earth, requested the Lord to teach Ayurveda to the human race. Lord Dhanvantari was then born in the royal household of Kasi. He developed ascetic tendencies even as a young boy and performed severe austerities. Lord Brahmawith great difficulty persuaded Him to accept lordship over the city of Kasi and since then He bacame known as Kasi-raja. As a king He prepared the samhitas on Ayurveda in eight divisions for the benefit of humanity. The Bhagavatam states "smrta-matrarti-nasanah" One who remembers the name of Dhanvantari can be released from all disease.